Coming up there are several tributes to music that you love in September, October, and November. There is an eclectic mix of artists and musical styles represented in this list including bands like the Grateful Dead, Van Halen, and R.E.M. Enjoy loving homages to singular icons like Elvis, Michael Jackson, and David Bowie. And you can miss Laser Pink Floyd at the Union Colony Civic Center. A one-of-a-kind annual music festival, My Favorite Bands features Colorado’s best bands covering the greatest bands of all time. The festival’s focus is not any particular style of music, but rather pays tribute to the artists who inspire the musicians on stage. This musical melting pot approach makes room for all the entertaining flavors to satisfy a crowd all night long. Check it out on September 14! Enjoy the songs of the Traveling Wilburys by Roy & the Boys. Enjoy the alternative rock sound of R.E.M. performed by Confusion Van. It’s a tribute to the bombastic rock anthems of David Lee Roth era Van Halen and The Who. The fun continues at the Moxi Theater for only $10! The movie soundtrack includes music by Public Enemy, Talking Heads, Motley Crue, INXS, and more. Surrounded by walls of concert quality sound on September 21. 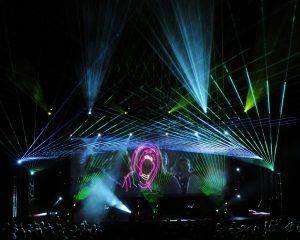 Pink Floyd Laser Spectacular carries listeners away on a mind-expanding journey: driven by cutting-edge effects, high-powered lasers, large screen video projection and special lighting—all set to the greatest hits of the classic rock band Pink Floyd. The show begins at 7:30 p.m. Check out tributes to Styx and Rush at the Moxi Theater. Remember turning up the radio and singing along at the top of your lungs to classics like, “Come Sail Away”, “Too Much Time On My Hands”, and the song that got it all rolling for Styx, “Lady”? There is only one Rush, You know it, we know it! But we think there’s enough Rush “love” in Northern Colorado for a tribute band… “Rush Archives”… We plan to keep it rockin’, faithful to the power trio format and watch it evolve over time. One of the longest running Grateful Dead tribute bands in the world, Shakedown Street, makes its home in and around the Rocky Mountain region. An Incredible National Touring World Class Theatrical Revue Honoring Elvis Presley, Michael Jackson, Bruno Mars, Cab Calloway, Jackie Wilson, Little Richard and James Brown. American Music Icons’ resurrects each featured icons’ legendary showmanship, dynamic stage presence, and classic style. George Gray and the Elvis Experience Band return to the Union Colony Civic Center for their 11th annual concert, “Elvis: Salute to the Blue”. This concert is dedicated to honor and show support for our current men and women in law enforcement and those who have fallen. Special guests from local police agencies will join George Gray and his 17-member band on stage as they perform Elvis’ greatest hits.